An incident He says about the Pharisee's and the scribes that "They tie up heavy burdens and lay them on men's shoulders, but they themselves are unwilling to move them with so much as a finger." (Mat. 23:4). Jesus was exactly not this way. There you would find harmony between life and doctrine - He was what He taught! He never presented for anybody, an ideal - or admonished anybody, without doing the exact same thing Himself. - Therefore you can know when you read that Jesus asks somebody about anything, that He is that way Himself. Read for example v.43-44, with the word Jesus spoke on the cross in mind: "Father, forgive them; for they do not know what they are doing." (Luke 23:34). He was exactly the child of His Father in heaven (v45a) - "He who is love" (1 John 4:8-16), and therefore does not treat people differently. His love includes everybody. - Jesus died for everybody - in everybody's place - also for His enemies. He really prays that this sin - that they take His life - must be forgiven. And He is heard when He prays! Paul writes to the Corinthians among other things: "God was in Christ reconciling the world to Himself, not counting their trespasses against them, and He has committed to us the word of reconciliation." 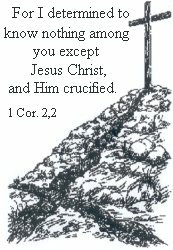 (2 Cor.5:19). "God was..." It is God's love to us humans - also to those who performed the misdeed - you see at Golgotha, as He Himself takes our seat, so that we can have His. He buys us out - friends as enemies - of our lost condition, with His own life. How different isn't He from us! When you go to Him, do not imagine someone with human thoughts - certainly not one as narrow-hearted as us, but yet with clear restrictions. - No, there is no limits for His love, if you had sinned or messed up seventy times seven the same day, and came to Him with it, He would receive you, without reproach. (Mat. 18:22). If He wanted to blame you for something, it would be that you hesitated to come to Him -: "You of little faith! - Why did you doubt?" Yes, exactly because you have little faith! The mind He has, is the mind He wants to be active in His believers. Yes, you surely see that in this passage? But we do not want to be anyone's servants. We want everyone else to serve us, at least to be the way we think they ought to be. - Then we can love and greet them. (v.46-47). This is the worlds - and not Jesus' mind. There are those who have come to this that Jesus did not preach the law, but only the Gospel. They can't possibly have read for example v.48 in this our passage here. Let this word reach your heart and then answer: How much do you have left? Maybe you already had started being satisfied with yourself? - Look, there is still a bit left to go? Perfect like God! Then we say: No, that can't be Jesus opinion? "Be!" Jesus says in short. Do you hear this? Be that! "He causes His sun to rise on the evil and the good, etc." This is not human, it is divine, and we are called to be like Him. Have you at all tried to achieve this sometime, if just for one day in your life? - To love everyone with the same love. Family and friends, as enemies and opponents - without regard to race, tendency, way of being - no matter how their attitude to, and behavior towards you is - love them all unconditionally and without the persons reputation. No, we probably fit under the description Jesus gives us in v.43. That is natural for us. But Jesus temper in us is not like that! - And that is what we are called to give room for. And listen! : You have not been given any alternative here. It becomes so incredible, but amazingly good, to see, that this is how Jesus is! This is how He is, He who also today says to you: "Come to Me!" "Come to me!" Who? Hear what the law answers: "Who may ascend into the hill of the LORD? And who may stand in His holy place? He who has clean hands and a pure heart, Who has not lifted up his soul to falsehood And has not sworn deceitfully." (Ps.4:3-4). And listen what the Gospel replies: "Come to Me, all who are weary and heavy-laden, and I will give you rest." (Mat.11:28). Yes, you must be the way the law demands to be able to stand before God, and that is exactly what you are called to have in Jesus Christ - the righteousness the law and the prophets testified about. (Rom.3:21). Not in yourself, but in Him! Therefore it is called rest, what you are called to. Would you say that that is the perfect description of your Christian life - of your relationship to the Lord: Rest! Or are you driven here and there by all the "plans" He allegedly has for your life? He has one cardinal plan for your life, and Paul describes this so clearly in his letter to the Colossians: "We proclaim Him, admonishing every man and teaching every man with all wisdom, so that we may present every man complete in Christ." (Col. 1:28). Complete in Christ! Complete as your heavenly Father is complete: In Christ. This you are by faith in Jesus, otherwise this faith could not save you. But now Jesus wants that what you are by faith in Him, also will take form in you. - You do not discuss this with Him, do you? Or would you slip away with a: "No, I am such a big sinner that..." Listen! - You are called to let Him take form in you, and not to a self improvement of your old person. You shall not use your own sinful misery as a weapon against His admonitions and will, but should drive you towards Him, so that His will can be done in you. Then the keynote won't be: "How long have I come on the way to perfection?" - But: "How great isn't His mercy towards me!" - And your sinful misery will no longer become a fortification to ensconce yourself behind, with your sin, but something you so dearly want to get rid of, just as if you would have had a dead body tied to your back. "Don't deceive yourself!" - is the Scriptures clear warning. Read through this passage - this Jesus word - and ask: - Am I like this? "If we say that we have no sin, we are deceiving ourselves and the truth is not in us." (1 John 1:8).